Where were we? Friday afternoon, I had just walked back up the from the pond. I was hoping to get several good bird shots while we were in Maine, but that just didn't pan out. Ultimately, I didn't have the patience or cold weather gear to hold out to get great shots of several different species. 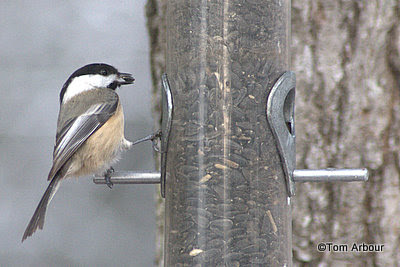 Although, this black capped chickadee did oblige. Where Megan and I live in Ohio, we have Carolina chickadees, so it is nice to see the black caps. To me, they are a little bigger and more handsome, but this is perhaps because our city birds are "dirty" from rolling around in dust and grime piles! Glen had five feeders out, and they were being visited by downy woodpeckers, white breasted and red breasted nuthatch, and a bevy of red squirrels. Being almost dinner time, I headed up to the house to see what was going on. Sure enough, someone had began to defrost shrimp in the sink. I wanted to take a picture of the shrimp for microstock, and it was quite dark in the kitchen, so I got out my Vivitar 285hv flash to illuminate the scene. I took the picture, and looked at the camera, and my jaw dropped. 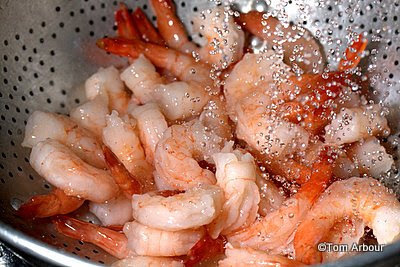 I no idea that I would be able to stop the stream of water raining down on the shrimp with my flash. It was very cool, and I had to try it again, taking a picture of just the water. If you have an SLR camera but don't have an off camera flash, you are missing out on some fantastic creative opportunities. I used to think I never would need flash, but now that I've had one for about six months, it really comes in handy and I take in wherever I go. After the shrimp and water photography, I noticed a bag of live creatures on the porch. I took one out, let it crawl around the floor, and was fascinated by its colors and shapes. 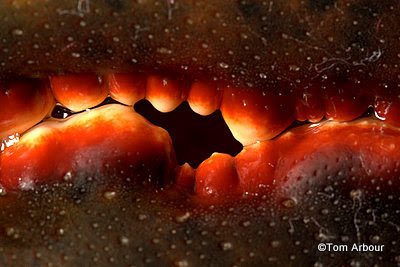 When looking at the lobster's claws close up, it appears that they have very different uses. The left claw, full of tiny barbs and hooks, looks like it is designed to hold onto prey items. However, the left claw, which is lined with bumps that remind me of our own molars, looks like it is designed to crush prey. Photographing the lobster was fascinating. I'll leave it up to the imagination as to what happened next. A full belly, it wasn't much longer before Megan and I headed to bed, ready for our last day (Saturday) at little pond. There was quite a bit of bird life, and I was able to see a brown tree creeper, and squawking above, these three ravens. Ravens are common at Little Pond, but here in Ohio, we just had our first confirmed modern nesting of Ravens this year. 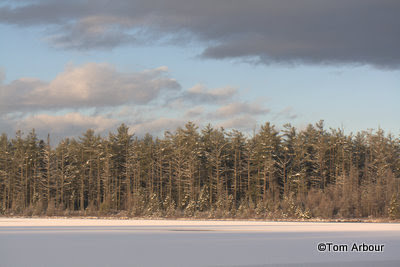 I always enjoy the ravens, but they stay far away from the house at little pond. 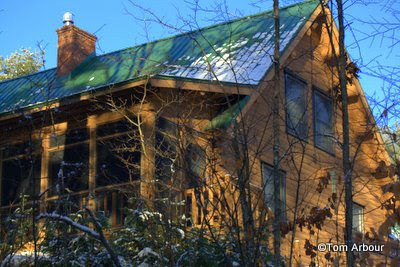 The house is a log home, nested at the top of little pond on a peninsula between the pond and a marsh. The house itself faces away from the road. The original owners had the house face that way so its large sliding glass doors would look out towards the pond rather than back at the woods. Since the front of the house is so close to the woods, it is quite hard to get a shot of the real front facade. 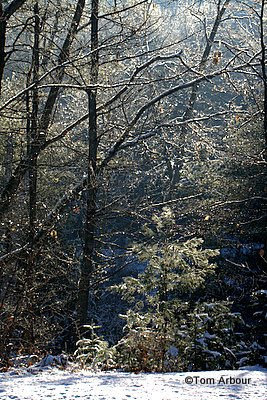 I was poking up around the woods just below the house when the sun rose up above the hills, providing dramatic lighting to the ice and snow covered forest. 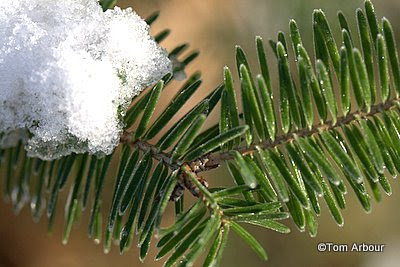 A snow covered branch of balsam fir, the conifer so revered for its fragance at this time of year. It seems as if every church in Maine sells native balsam fir wreaths for fundraisers at this time of year. 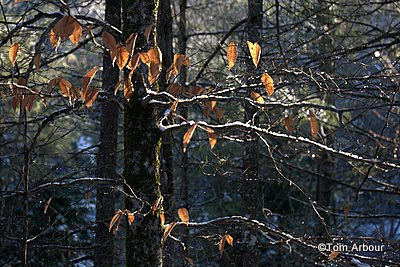 Another tree that caught my eye in the sun was this American beech, still holding on to its leaves. And finally, as I walked up towards the house, ready to go in, as I was pretty cold by this time, the sun was simply spectacular as it shot through the trees. Part of the photography challenge I have at little pond is to continually capture unique and interesting images. We visit here often, and although the property is only 40 acres or so, things are pretty similar. I saw this shot and just new I had something interesting and different from anything that I had ever captured at little pond. The small white pine, coupled with the right-arching deciduous branches provides an interesting contrast and balance to the image. 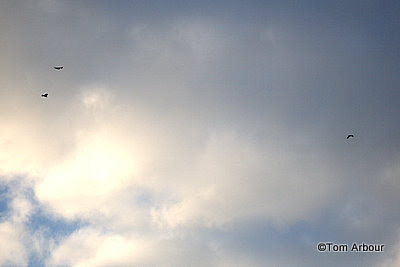 Although shooting into the sunlight is typically a "no-no" in nature photography, I think this shot works. I had to shade the lens by holding out my hat above and in front of the camera. Megan and I packed and later we headed to Portland to catch our flight back to Columbus. On the way, we stopped with the family at Dimillo's a floating seafood restaurant in Maine. Satisfied with my bounty of seafood for the weekend (lobster, PEI mussels, shrimp) I was ready to head back to Columbus. I hope you enjoyed our trip to Maine. That is one gorgeous lobstah! 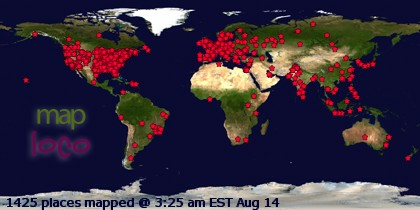 At least he is forever immortalized in cyberspace. Those shots of the claws are wild. 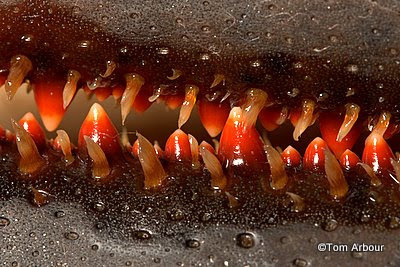 If I didn't know what I was looking at, I would think they belonged in the jaws of some ferocious beast! 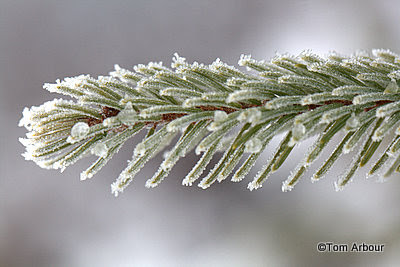 That last shot, and the one of the balsam fir, would make a beautiful Christmas card. i went to high school with megan. 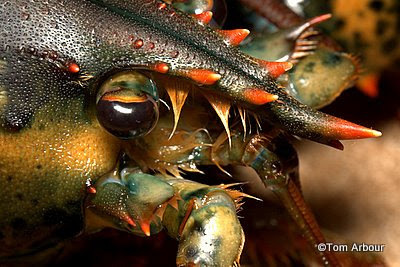 she could probably tell you that the lobsters' claws are called "pinchers" and "crushers." your photos clearly demonstrate which is which. 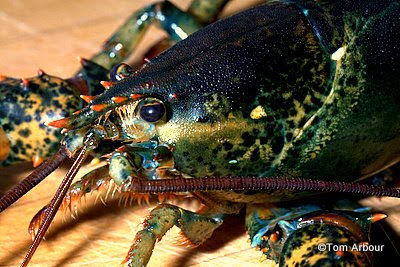 lobsters can be either right- or left-handed, meaning the crusher is not always on a specific side. since i didn't grow up on the coast (obviously), i'm not sure which claw dictates handedness, but thought this information might be useful. As usual, you've got some gorgeous shots, Tom. I can almost taste that lobster and shrimp. I love love love both. Shooting into the sun? I do it now and then, to get an effect. I once won a photo contest with a shot where I did that. 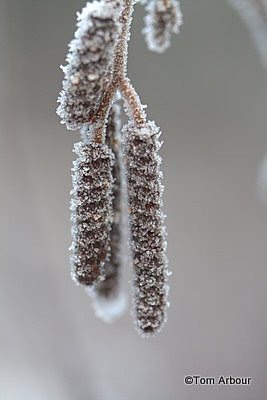 It resulted in teasel growing on a creek bank being silhouetted against a blue-gray wintery sky that foretold of snow, with the muted sun up in the corner. I've done other ones at sunset, too, which also results in great silhouettes. I like to shoot into the sun when I'm looking up into tall trees or where the sun is shining through trees much as you did. Thanks for the tip on the water & for the lovely & interesting shots of the lobster! How very COOL! 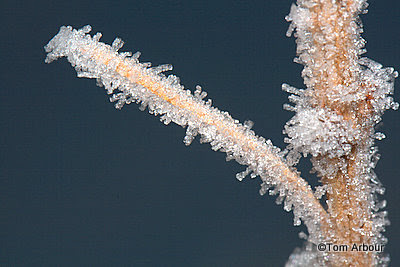 Although too cold for my liking, frost can sure make for some beautiful scenes. Some of your photos remind me of Winter drives past Niagara Falls, with the mist having frozen like a thick glaze of crystal on EVERYTHING it touches. Oh what a wonderful lobster tail! 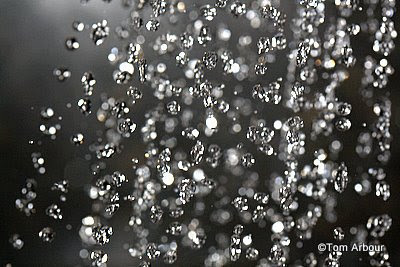 Love all th aclose ups, water, lobster, ice crystals. i long for two things, a macro and snow. Tom: What neat photos you took in Maine. The lobster was outsatnding and the ice pictures were cool. Earthmother- Yes, he is. Thanks for the Christmas card ideas. I hadn't thought that those types of shots would sell at microstock sites (i'm selling photographs now there) but now that you mention, I think you are right! That is really interesting. I did wonder if all lobsters had the crushers on the left, etc. Thank you! Hi Kylee- Thank you very much. Shooting into the sun can be very effective. I think I was basing that rule on something I read on the pop photo flash blog. I'm glad you think the image worked! Now I'm missing the seafood as well. There just isn't anything like fresh ocean seafood that wasn't flown to you like it has to be done here in Ohio. Thanks Lana- Speaking of Niagra, Megan has never been there. I've never been there during winter, and I'm sure it would be spectacular. Hi Arija- Thanks for visiting and commenting. I take plenty of macro shots, including some insect shots for a blog that I'm preparing right now. Tom- Yes, it was COOL!